The Team at DataSpace are always looking at ways to continually improve our services, technology and facilities. It is vital that we are up-to-date and leading with the latest developments to offer to our clients. This commitment also extends to our investment in a new purpose built document & data storage centres. The New Year will see further developments at DataSpace as we are just starting to break ground to further extend the storage facilities at the Cheshire site. The facility will of course be protected by advanced security measures including CCTV and be humidity monitored / controlled. 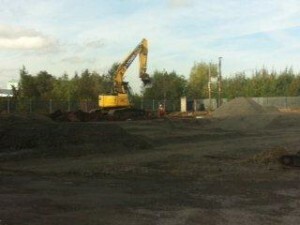 Initial development works have started in preparing the site in advance of the construction. 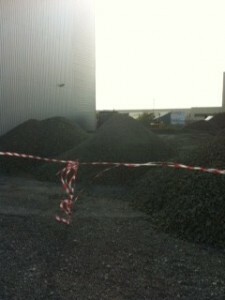 We have added a few pictures which show the site preparations. So, exactly how much extra space will the latest building offer? Well 600,000cft to be precise. The facility will be one of the highest data storage facilities in the UK with internal eaves heights that extend above 20 meters. The facility will be fitted with purpose built steel multi-tier racking which offers a safe and clean storage environment for our client’s sensitive documentation. The facility has also been designed to be incorporated into our BS5454 certification and will have the enhancements to the building that sets the facility apart from normal storage facilities. 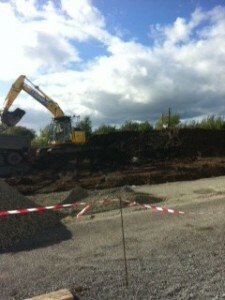 As you can see from our latest news, we are expanding as our clients require more and more space to store their data. DataSpace clients not only benefit from modern purpose built facilities, unlike some of our competitors, but the additional technology wrappers that are applied to the control and management of that data that can drive real efficiency savings within our clients organisations. As this is exciting news for DataSpace we will be sharing the progress on a regular basis via our blog, Facebook and Twitter accounts; so if you haven’t already followed us on Twitter of liked us on Facebook, now is the time to do so!